A visit to the Lisa Sainsbury Library feels like a real treat. The shelves are densely packed with one of the best and most comprehensive collection of resources on Japanese visual culture in the UK. The space is light, bright, beautiful and quiet, only disturbed by the squawk of Norwich Cathedral’s resident peregrine or the shimmering rustle of bamboo leaves outside the window. In short, it is a welcoming sanctuary. And yet, perhaps to the dismay of the busy librarian, the Library is in a state of constant activity. On average 2000 books are added every year, and there are now around 40,000 volumes including the distinguished academic resources of the Matsushita, Yanagisawa, Bernard Leach, Carmen Blacker and Gina Barns collections, some of which are still in the process of being catalogued. In 2012 the Library celebrated its first decade. This will be celebrated with a commemorative exhibition featuring the Cortazzi map collection, a collection of old and rare maps of the country collected and entrusted to the Library by Sir Hugh and Lady Cortazzi , which will be held at the Embassy of Japan from late June 2013. 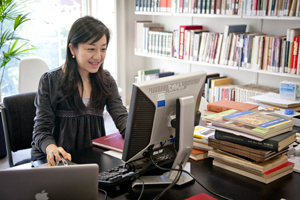 Resources coming into the Library are not confined to published ones only: in September 2012 we welcomed Miss Yamada Maya as the first librarian from Japan to spend three months in Norwich under a new librarian exchange scheme established between the Institute and Keio University. With the library collection expanding and users eager to access new acquisitions, Maya and her work made a significant contribution to the Library’s efficacy. She completed her secondment in the depths of a cold English winter before returning to her home institution in Tokyo in December. With spring fast approaching (or so we are told), we asked Maya to reflect on what it meant both professionally and personally to spend time in this historic cathedral city. Could you tell us your first impression of the Sainsbury Institute? 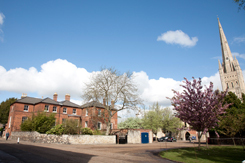 I was very excited to discover that the Institute is housed in one of the historic buildings of Norwich Cathedral Close and that this would be my home during my secondment. I found the Lisa Sainsbury Library to be an absolute gem. An open space with sun streaming through the windows, the Library is a perfect place to settle down and read in the quiet of the Cathedral Close. Together with the old maps that are on display in the Library’s reading room, the space felt as though I was in the comfort of my own home office. What was the purpose of your secondment and your tasks here? The objective of the exchange was to learn about collection development methodology and reference services, and to support research by working on cataloguing the collection. 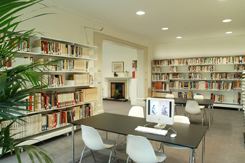 The programme is also intended so that the Keio University library can build networks with libraries in the UK, in this case the Lisa Sainsbury Library, which has unique specialist resources on Japanese art, culture and archaeology outside Japan. What, in your view, are the key features of the Lisa Sainsbury Library? As I mentioned the Library is unique outside of Japan in its extraordinary quantity of materials on Japanese art, culture and archaeology written in Japanese. The collections, in addition to those donated to the Library by Japanese and non-Japanese scholars, include rare books, new publications, periodicals and exhibition catalogues that are crucial for art research. There is a great deal of material that is difficult to obtain even in Japan, such as archaeological excavations reports covering most areas of the country as well as museum brochures and information materials. The Library’s web-based database is also comprehensive. Each entry includes additional details if applicable; for example, exhibition catalogues may contain notes on the exhibition period, venue, etc. The catalogue search system allows easy access to the appropriate publication. Mr Hirano Akira who has served as the librarian since the library’s foundation, single-handedly manages acquisition and data registration. He possesses a holistic knowledge of the entire collection, and generously applies this wealth of information when answering queries from scholars and the public. He is yet another resource which brands the Lisa Sainsbury Library as an important specialist library. Could you tell us any memorable episodes from your secondment? Browsing in the library I saw many books that my own institution was considering buying. It was revealing to meet visitors both local and from abroad who had a particular interest in Japan. And it was a valuable experience to observe and help with cataloguing in the Japan Section library of the British Museum, as well as to become familiar with the facility, research and learning support services available at University of East Anglia and at SOAS. My time at the Institute provided opportunities beyond library management. My stay overlapped with many of the Institute’s events including the Toshiba Lectures in Japanese Art series where I was fortunate enough to encounter researchers, museum specialists and the public interested in Japanese art and culture. I was humbled to realise that the Institute’s varied and frequent activities are all planned, managed and executed by a small team of dedicated staff and also that there are so many people living outside Japan who are fascinated by Japanese arts and cultures. I was touched by the kindness of the staff and people connected to the Institute. Thanks to them, I learned much about Norwich Cathedral and other city landmarks such as the quaint street of Elm Hill and see the beauty of nearby sites like Blickling Hall. I was able to enjoy first hand the history and culture of England as well as the abundant natural environment with visits to the Norfolk Coast. Norwich is certainly a city I would like to visit again. My three-months secondment proved to be a wonderful and important experience and I would like to take this opportunity to thank everyone who made my stay a very warm one indeed.